Image: Crutching sheep involves removing some of the skin from the backend of sheep to reduce the chance of flystrike. Crutching1 by cGoodwin is licensed under Creative Commons BY-SA 3.0. Injectable pain relief is now available for use sheep, but it is too late for the mulesing debate? A newly available injectable pain relief product has recently been approved for use in sheep, giving Australian farmers another strategy to improve animal welfare standards. Metacam 20 has been readily available for use in horses and pigs for some time and was recently approved for use in sheep over 14 days old by the Australian Pesticides and Veterinary Medicines Authority (APVMA). Unlike other pain relief options, Metacam 20 is the only known drug that can be administered to sheep prior to crutching. 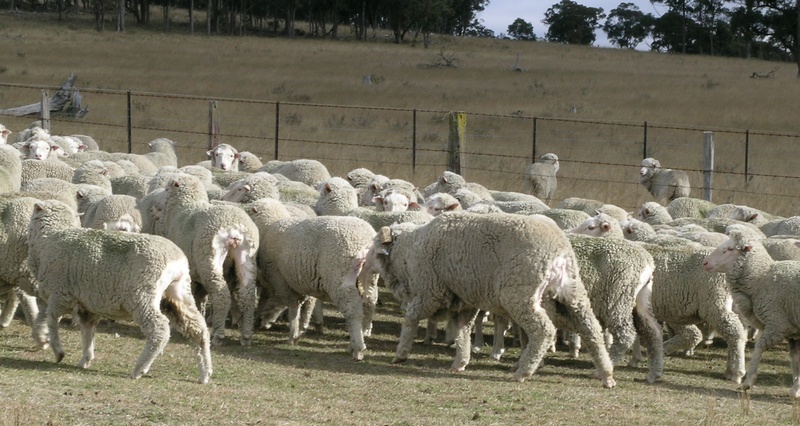 In 2011, the Australian-developed product – Tri-Solfen – was released to the market for use after surgical mulesing of sheep. Data released by parent company Animal Ethics Pty Ltd showed that 58% of Australian lambs were treated with Tri-Solfen in 2014, with state figures ranging between 82% (South Australia) and 16% (Queensland). Increasing use of Tri-Solfen has been driven by pressure from textile buyers seeking wool from sources where mulesing is either banned or carried out with sufficient pain relief. At between 40-50 cents per head, Tri-Solfen offered growers a cost effective way to stay on the right side of the market. At around $4 per head, Metacam 20 is significantly more expensive than Tri-Solfen. While Metacam 20 does offer preventative pain relief, it is unclear whether animal welfare groups are willing to back down on a total ban of mulesing. Guidelines set out by the Responsible Wool Standard (RWS) appear to advocate for the complete absence of mulesing, rather than the use of adequate pain relief – a concern for the industry given more and more major retailers are publically supporting the RWS. The RWS was set up by Textile Exchange – a not-for-profit organisation representing the textile industry – in response to growing calls from the industry to develop global standards for the ethical and sustainable production of wool garments. In 2007, the New Zealand government started ‘phasing out’ mulesing in response to growing criticism from animal rights groups and consumers. Shifting attitudes towards the practice were seen quickly in the private sector, with the launch of ZQ – an opt-in accreditation program for wool growers that includes a no-mulesing policy. New Zealand Merino Company – the developer of ZQ – claim that the program has opened more doors for accredited growers, including the stabilisation of wool prices through the availability of forward contracts. The practice of mulesing was named after John WH Mules, who accidentally cut the skin from the hind end of a ewe during shearing. Noticing the ewe did not suffer from flystrike, he started crutching all his sheep. The fly responsible for fly strike – Lucilia cuprina – is thought to have been introduced to Australia from South Africa in the nineteenth century. Mulesing was approved by the Australian Government for use in the 1930s. The practice was due to be phased out by 2010, but the wool industry voted against the ban due to a lack of effective alternatives.